Ido Lekota’s article in Sowetan of 06 January headlined, “Larger than Life” refers. It is one thing to be lied to but quite another when one lies to him/herself. Lekota wrote about “the humility and selflessness carried in Nelson Mandela’s 11 February 1990 speech”. I listened to the entire speech from Victoria, Canada and Mandela thanked all the Anti- Apartheid organisations but left out the PAC and BCM. A year or two later he was interviewed by Charlayne Hunter-Gault on PBS’s News Hour television programme in which he said that the protestations by the PAC and APLA were “a storm in a tea cup”. He has amassed wealth for himself, his children, grand children and great grant children, according to his former lawyer Ishmael Ayob. Is this humility and selflessness in Ido Lekota’s book? I doubt if Ido Lekota has read Young Mandela by David James Smith. If he did, he would not have written the things he wrote. He ascribed the concept of reconciliation to Mandela. If he read Benjamin Pogrund’s “How Can Man Die Better” which is about the life of PAC founding President, Mangaliso Robert Sobukwe, he would know better. Allow me to quote a passage from that book to show that Sobukwe was reconciliatory long before Mandela could think about the concept. Alex Boraine had visited Sobukwe at Groote Schuur hospital in late 1977. Boraine said he knew Sobukwe was dying and thought he (Boraine) would just ask him how Sobukwe saw the future and what he thought about the past. “I expected a sort of outpouring of bitterness about the way he had been treated: the Sobukwe Clause, his banishment, and so on. But he was remarkably gentle. Not that he was weak. He was gentle with a strength that was very humbling. He said that he felt desperately sorry for the government because they were blind to realities”, Boraine explained. Sobukwe continued to say, “We must forgive them because they really don’t know what they are doing. We must pray for them that their eyes will be opened. Will you pray for them now?” Boraine prayed for Sobukwe although he hadn’t asked for it and also prayed for the government. 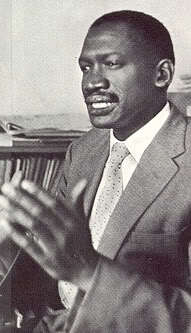 Sobukwe prayed and said again, “Father, forgive them. Take away all bitterness from us and help us to work for a country where we will all love each other, and not hate each other because hate will destroy us all.” This on page 364. Sobukwe said these things on his death bed.Obviously Lekota is oblivious to this. If he is not then he is the most disingenuous and intellectually dishonest African journalist to set foot on this planet. Lekota wrote that he was proud of what South Africa achieved in the past 15 years of democracy and pointed out that under Mandela, South Africa was put on the route to democracy, but what the country has since achieved was to put in place institutions that would make it possible for democracy to thrive. What democracy? Lekota should understand that there can be no democracy where crucial economic and financial decisions are made by a handful of people.